Early one morning this week, before I had turned on the lights, I noticed this local visitor looking at me through the kitchen window. We stared at each other for quite a while before I decided to take some photos. I was hoping that he would hang around until the sun came up but he decided that it was time to move on before the light was stronger. A number of deer live on our property. We often find areas of softer grasses in the pastures that have been pressed down from them lying down in the night. We quite frequently see the deer, especially in late afternoons and early evenings. 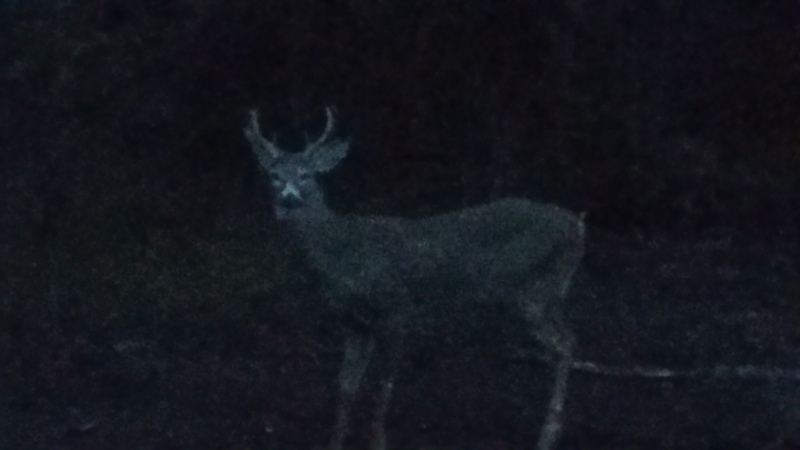 One is a large 8 point buck who doesn’t seem to be very afraid of people. Several times he has stood and stared at me from a reasonably close distance when I was walking by. It is interesting to have them around and, so far, they haven’t done too much damage to Jonathan’s fruit trees in the orchard. If they start to cause a lot of damage we may have to do something about them. We have heard that people used to hunt on our property but we aren’t too keen on having strangers with guns roaming the land, especially with grandchildren here. Andrew is talking about taking up bow-hunting. We’ll see what happens. If you get a livestock guardian dog to protect your goats (when you get them), it will keep the deer away.